Being a parent is one of the most gratifying titles a person can hold. But the responsibility that comes with it is no easy feat. Mom’s in particular often have to sacrifice things they love doing the most or set aside favorite hobbies in order to put focus on the well-being of their families. And often than not, they forget to take care of themselves as they are busy putting the family’s needs first before theirs. 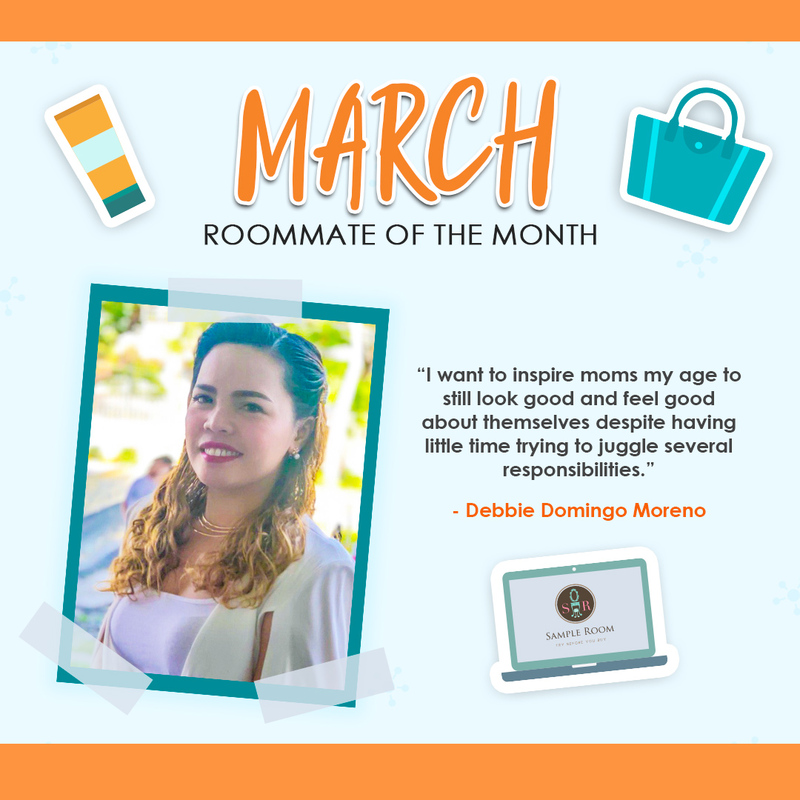 But for Debbie Domingo Moreno, our March #RoommateOfTheMonth, a hectic schedule and a busy lifestyle is not an excuse to let go of self-care, our dreams, and our passions. With the hopes of inspiring moms her age to find their inner confidence and be able to age gracefully, Debbie decided to share her beauty know-how's and favorite Sample Room finds on her social media pages all while trying to balance the responsibilities of being a mom, an entrepreneur, and a government employee at the same time. Let’s get to know more about this boss momma as she answers a few questions from us about her beauty and sampling journey! 1. Tell us about you and your love for beauty. 2. When did you start and what inspired you to share your beauty finds on your social media accounts? 3. Who are the bloggers that you look up to? 1. Share with us your skincare routine! 2. How about your makeup routine? STEP 1: Primer. For my skin type, I choose a primer with a pink undertone. STEP 3: Loose Powder. I apply loose powder before putting pressed powder because when I don’t, I usually experience skin breakouts. STEP 4: Pressed powder. What I usually do is that I spray facial mist to the sponge before applying the powder to my face. 3. What are the top 5 beauty products (skincare and makeup) that you can't live without? 1. When did you first find out about Sample Room? 2. How did Sample Room help you in your journey into the world of skincare and makeup? 3. What were your best finds that you discovered through our site? 4. Do you see yourself still sampling in Sample Room in 3-5 years? 5. Any advice for your fellow roommates for their sampling journey? It is quite overwhelming when we have a lot on our plate but once we find the right balance between our day-to-day activities and responsibilities, we’ll find that we are much more capable of doing a lot more for ourselves and for our families. And just like Debbie, no matter how busy life gets, we should always give time in doing things that make us happy so that we can live life to the fullest and conquer life’s challenges confidently. Catch Debbie’s latest posts about her activities and new beauty finds at https://www.instagram.com/wanderwomom_ and https://www.facebook.com/wanderwom0m. Aiming to be the next Roommate of the Month? Be active in our community and share your best Sample Room finds on your social media accounts using the hashtags #RoommateOfTheMonth, #SampleRoomSpotlight, and #SampleRoomPH. You might just be our next featured roommate!